"Waity Katie" must wait no more. A mere eight years since the couple met, Britain's Prince William is officially engaged to Kate Middleton, royal officials said today. "The Prince of Wales is delighted to announce the engagement of Prince William to Miss Catherine Middleton," the statement from Clarence House early Tuesday read. Prince William, 28, asked Middleton, also 28, to marry him while the two were on vacation in Kenya last month, the statement said. The happy couple appeared for the first time after the announcement today arm-in-arm before a barrage of camera flashes, Middleton wearing the famous engagement ring worn by William's mother, the late Princess Diana. "He's a true romantic and we had a wonderful holiday in Africa and it was out there in a very quiet lodge and it was very romantic and it was very personal time for both of us," said Middleton. In an interview with Britain's ITV News today, Middleton said the proposal came as a surprise, despite years of public speculation that the couple would wed.
"We were out there with friends, so I really didn't expect it at all," Middleton said. "It was a total shock when it came. Very excited!" The two met nearly a decade ago while students at the University of St. Andrews in Scotland. The relationship garnered some controversy because Middleton does not come from royalty and royals are generally expected to wed other aristocrats. William said the two were friends for more than a year and lived as flatmates. "It blossomed from then on," he said. "We had lots of fun. ... Same interests. She has a really naughty sense of humor." When asked why it took so long to propose, a beaming William quipped, "I also didn't realize it was a race, otherwise I probably would've been a lot quicker." "We have a great fun time together," the prince told reporters. As for the ring, William said, it, like Kate, was very special to him. "Well as you may recognize now, it's my mother's engagement ring and it's very special to me, as Kate is very special to me now as well. It was only right the two were put together," William said. "It was my way of making sure mother didn't miss out on today and the excitement and the fact that we're going to spend the rest of our lives together." Diana received the ring from Prince Charles after the two were engaged in 1981. At the time, the sapphire ring, which is surrounded by 14 diamonds, cost 30,000 pounds. "I had been carrying it around in my rucksack for about three weeks before [the proposal]," William told ITV. "Everywhere I went, I was keeping ahold of it, cause I knew if this thing disappeared, I'd be in a lot of trouble." "It's beautiful," Middleton said, as she showed the ring to ITV's camera. While Middleton is now wearing Diana's ring, William said that she won't be in his mother's shadow. "There's no pressure," he said. "Like Kate said, it is about carving your own future. No one is trying to fill my mother's shoes. What she did was fantastic. It's about making your own future and your own destiny, and Kate will do a very good job of that." William said he didn't know where to start when asked why the couple was apparently so loving, but said she makes him laugh. For her part, Kate said William was very supportive of her. The queen said she is "absolutely delighted" for the couple, Buckingham Palace said today. Like the queen, Middletons' parents, Michael and Carole Middleton, said they too were "absolutely delighted" by the announcement. "As you know Catherine and Prince William have been going out together for quite a number of years which is great for us because we got to know William really well. We all think he's wonderful and we're extremely fond of him," Michael Middleton told reporters today. "We wish them every happiness for the future." William admitted in an interview that he popped the question before asking for Michael Middleton's permission. 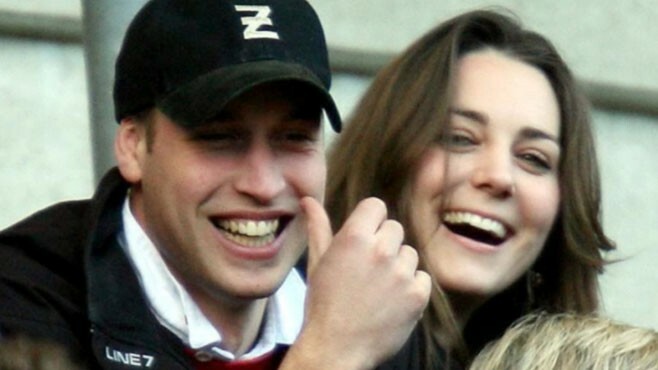 "I was torn between asking Kate's dad first and then the realization that he might actually say no," William told ITV. "I thought, if I ask Kate first, then he can't really say no, so I did it that way round and managed to speak to Mike sort of soon after." The announcement came to the elation of Britons, many of whom viewed the engagement as a seemingly inevitable, yet unreachable moment. Within just 25 minutes of the announcement's post on the royal Facebook page, more than 1,400 people "liked" the news. "It's about time! Congrats," one commenter wrote, a sentiment echoed by hundreds of others. The wedding will take place in the spring or summer next year in London, the statement said. British Prime Minister David Cameron said today he congratulated William on the engagement. "He was obviously extremely excited about the news and thrilled about what lies in store," Cameron told reporters. The couple plans to live in north Wales, where Prince William will continue his service in the Royal Air Force, the statement said. While the announcement was "welcome words" for Middleton, royal expert and Newsweek editor-in-chief Tina Brown said it was made after a shaky start. "This wedding was originally going to be announced in June, but there was a tussle," Brown said. According to her, the royal family disagreed about several details about the wedding even down to how the announcement would be made. At one point, William called the wedding off, Brown said. But after all was settled, William's father, Charles the Prince of Wales, was the one to make the announcement through royal officials. In a documentary aired on Britain's Sky News last month, William played coy about the deluge of engagement rumors the couple suffered for years. "There is always speculation," he said. "But, you know, it comes with the job, so get on with it." At the time, British bookmakers were so confident the wedding would happen in 2011 that they stopped taking bets -- a popular pastime for royal watchers and gossip-lovers. Middleton comes from a family of commoners. Her father was a pilot and mother a flight attendant. She has been the target of some criticism because she does not have a regular job of her own, aside from sporadic work in fashion. Middleton told ITV that she ignored much of what's said about her in the media. "I'm working hard and pulling my weight. Everyone can see. ... That's that matters to me. You have to be yourself. That's how I've stuck by." William and Kate broke up briefly in 2007 but were back together within months. Prince William is second in line for the throne, after his father Charles, Prince of Wales. Prince William's mother was Diana, Princess of Wales, who died in an auto accident in 1997. ABC News' Nick Watt, Sarah Netter, Jason Volack and Bradley Blackburn contributed to this report.